The CEO and COO are at their desks when I knock on the door, intently assembling robots to fulfill the company’s latest order. Tapster is about as lean as startups get. Founded three years ago (on Star Wars Day), the company’s two-person staff is half the size it was at its height, but a third employee moved on, and the fourth was more of an intern, really. It’s a humble operation headquartered in nondescript strip of stores in Oak Park, a quiet suburban village just outside of Chicago. Inside, a row of desktop 3D printers churn away on the products. Pieces of future robots are strewn about the desks, pulled from nearby shelves stocked with bins full of parts. To their right, crumbling wooden prototypes stand as a kind of museum to the humble company’s even humbler origins. An accidental startup of sorts, Tapster formed while Jason Huggins was working as CTO of his previous company, Sauce Labs — a Selenium testing startup. Burned out from software, the story goes, he enrolled in a laser cutting class at bygone maker space chain, Tech Shop. With those newfound skills, he built a button-clicking robot, and then, eventually, one capable of playing Angry Birds — all the rage back in 2011.The project gave Huggins a small YouTube hit and earned him speaking gigs at various tech conferences. It also managed to grab the attention of Mercedes-Benz. The luxury car maker was searching for an automated device to help test a self-parking app on its in-car touchscreen displays. A few months prior to officially founding the company, Huggins began work on his order for the car maker — 10 small robots designed to automate the testing of touchscreens by repeatedly and systematically tapping the hell out of them. 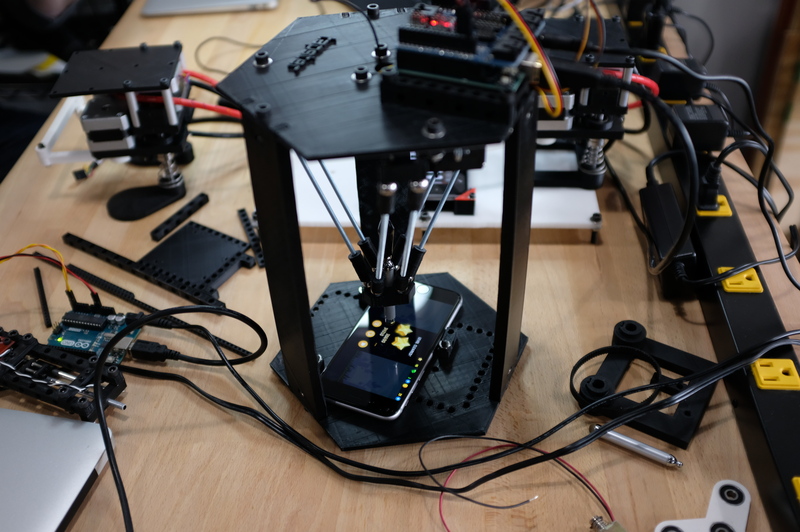 Granted, Tapster’s own processes aren’t too far removed. Huggins is a former Google Tester who’s become something of a full-time tinkerer, building robots from LEGO kits and self-modeled 3D-printed parts. He shows me a prototype of the company’s latest robot, which stands on a pair of Ronald McDonald feet. These sorts of automated robotics are common for hardware manufacturers looking to test touchscreens. 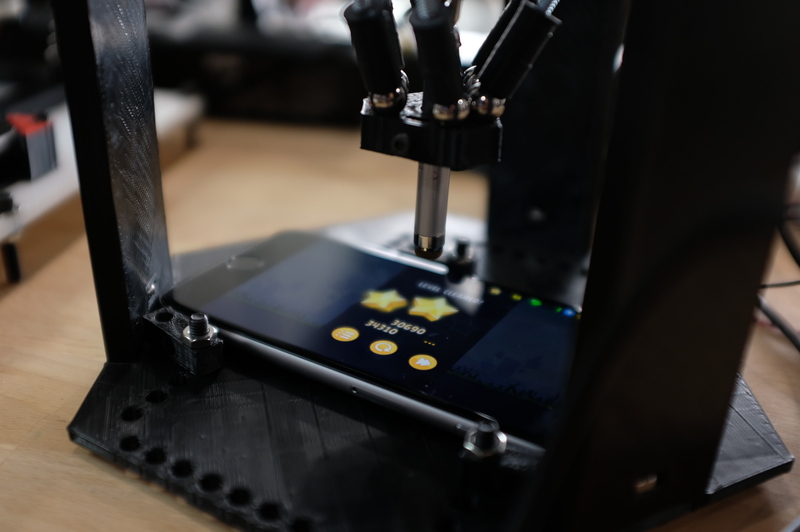 And while Tapster’s offerings are admittedly less sophisticated that the single service industrial robotics being deployed by larger organizations, Tapster is able to deliver their highly specialized product for a fraction of the cost.